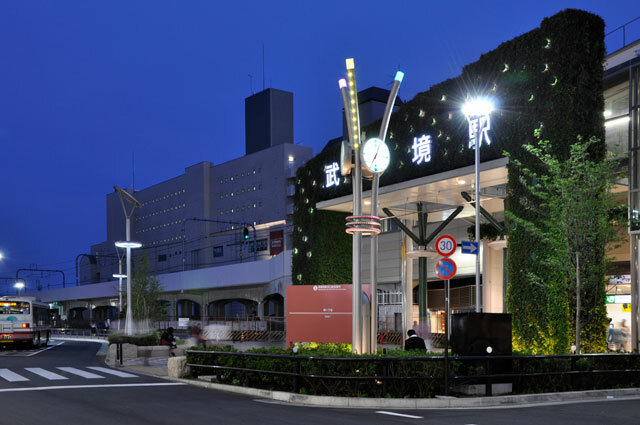 KIKUKAWA has developed and continues to invent green products that integrate beauty and functionality; such as Sustaina (the Building Integrated Photovoltaic Module), ecoAvenue (solar powered street lights), and adjustable louvers. To build a sustainable and beautiful city with metal – KIKUKAWA will continue to explore the possibilities of green buildings with metal. Ecosia is KIKUKAWA's brand of comprehensive solutions for greener buildings. It offers building systems that generate power and improve energy efficiency by combining the latest metalworking technology and MEP knowledge. Its distinguishing feature lies with its highly functional and beautiful design. Furthermore, these green products will benefit the buildings by increasing its value, lease rates and decreasing the utility costs. Here is a HVAC system that relies on infrared heating (also known as radiant heating); the transfer of heat from warmer to cooler objects. This easily installable system offers many benefits for the inhabitants and the environment, and has resolved many of the problems that impeded the adoption of conventional radiant heating systems. The health benefits stem from reduction of dust or other emissions, sound and any discomfort resulting from air flow. The system also improves the energy efficiency of the building, thereby reducing utility costs. KIKUKAWA is driven to create a beautiful, functional and comfortable space. For a building that generates energy in style. 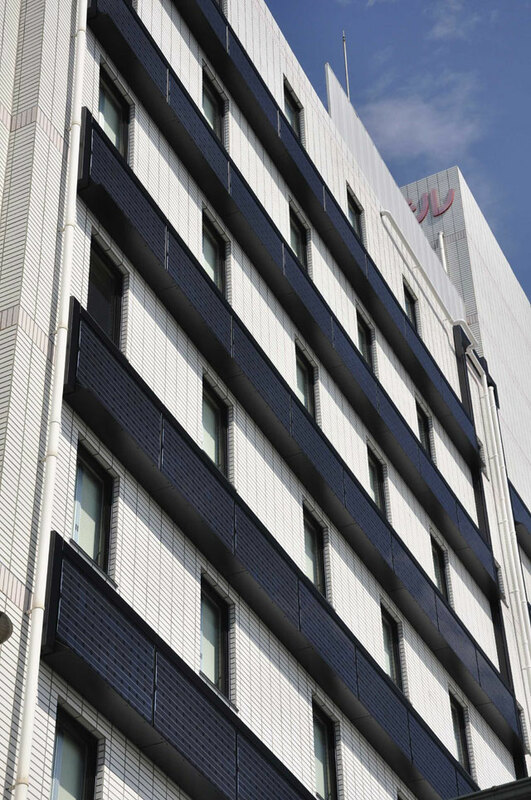 KIKUKAWA has developed solar powered facades to actualize design and functionality for BIPV products. KIKUKAWA's Sustaina envelops the building as an exterior that provides energy and an architectural accent. KIKUKAWA has developed an easily installable solar module system that allows the incorporation of many designs and solar cells. From design to installation, KIKUKAWA provides a comprehensive solution for the module system and building exteriors. Solar Park will provide shelter and power in style. The roof is made of semi-transparent photovoltaic modules and glass for a classic and stylish design. This model is equipped with a LED lighting system that runs on a motion sensor. 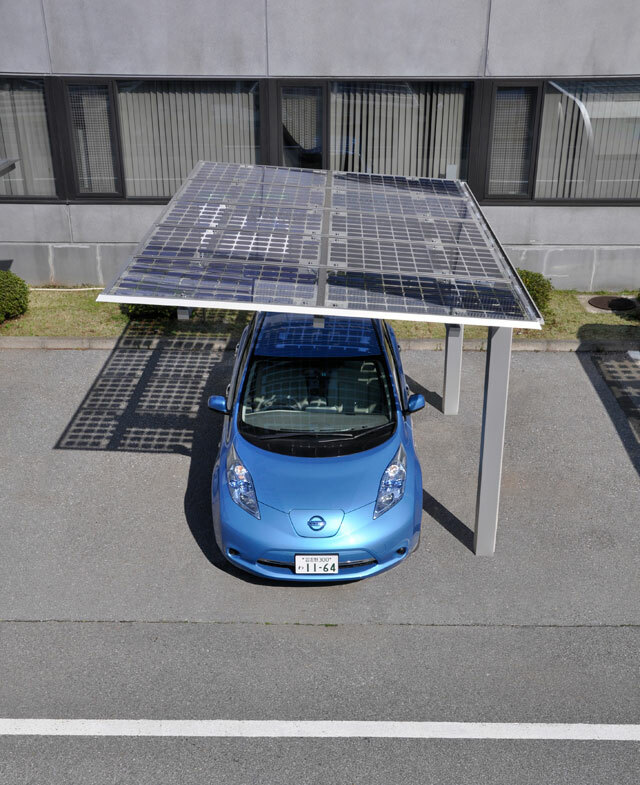 The carport can be customized to shelter multiple cars, or large scale carports that are over 10kW. 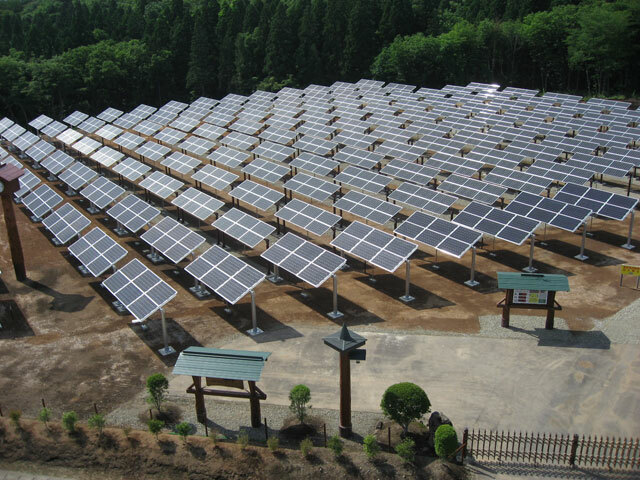 KIKUKAWA is able to provide comprehensive support from design to installation (EPC) for low to mid-level photovoltaic power stations. We will find a solution that fits your needs from budget compilation, to placement of the power station to the management of the system. Ecosia's louvers will increase the value of your building in style. 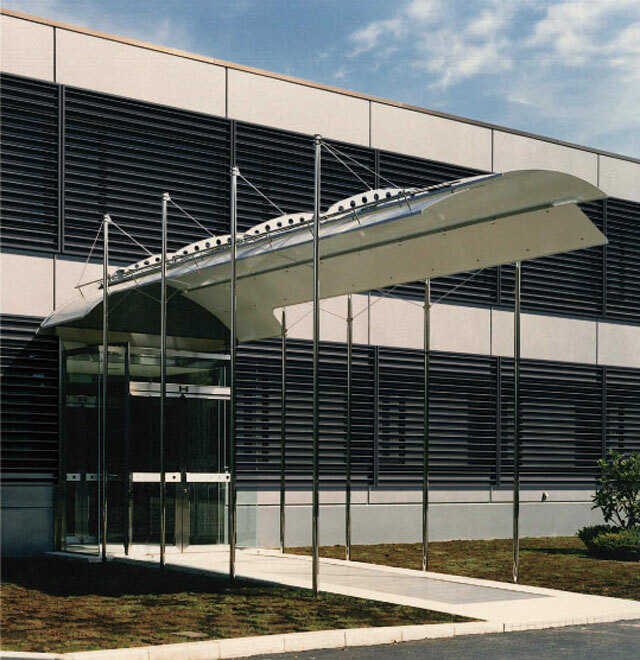 KIKUKAWA's louvers add architectural accents to a building, while efficiently and automatically providing insulation and sunlight intake. This is a result of a collaboration with the renowned Kochs. This system controls sunlight and heat gain while also allowing natural light to fill the room. This improves the energy efficiency of the building through higher quality insulation and decreased need for interior light. Other various types of louvers, including expanded metal, are also available. As sustainability gains importance in today's world, KIKUKAWA is developing and providing sustainable, resource-efficient and cost-effective "green" products. In essence, KIKUKAWA's products provide sustainable functionality and design. Here is a solar powered LED Street light that illuminates the night. For over 10 years, KIKUKAWA has been fabricating independently sourced solar powered LED street lights. The design and functionality of these street lights are one of a kind, but most importantly, they are customizable to suit your needs. As these lights are independently sourced, they provide safety and illumination consistently – even in emergencies. This street light will illuminate and prepare the path for a brighter future. The ecoAvenue series provide power and architectural accents to the city. The independent source provides illumination in case of emergencies. 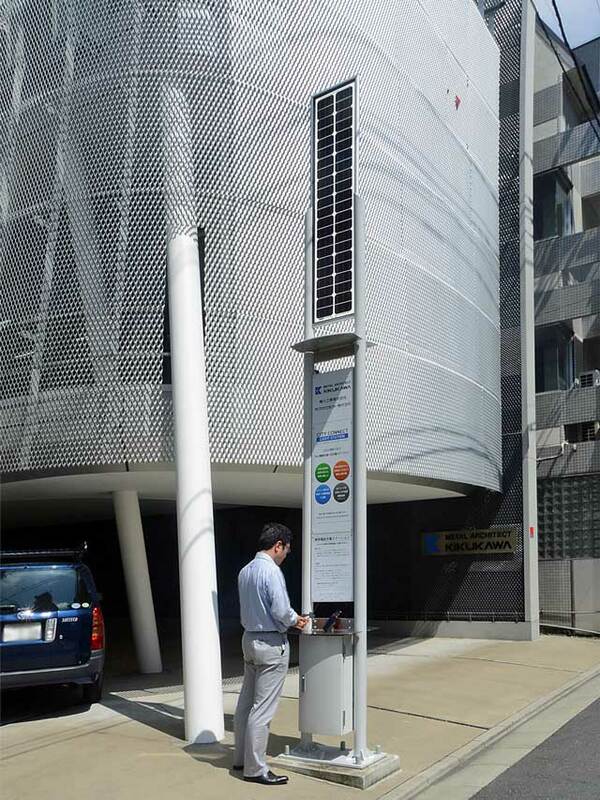 It has been installed in public areas; parks, public areas, hospitals, care centers as well as commercial buildings. These series can be customized with options such as "Emergency Supplies" and "AED." The series lineup, including custom options, provides solutions to various needs. Here is a product that can save a life – a street light with an AED box. 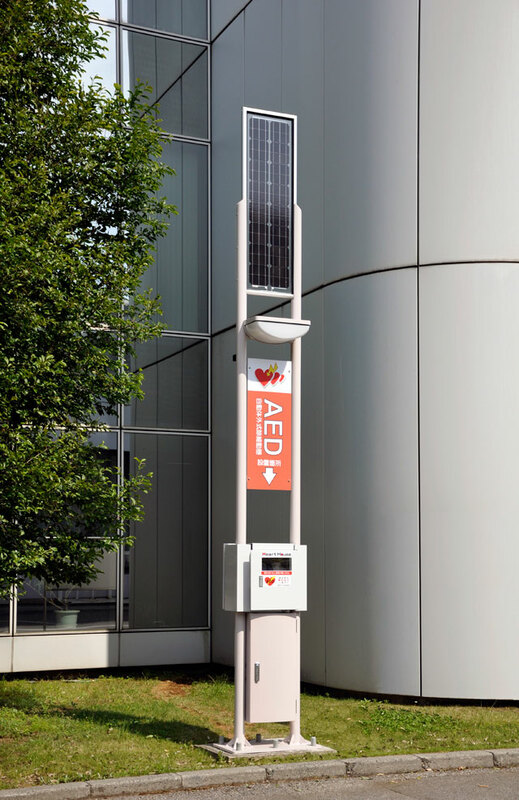 By controlling the humidity, KIKUAWA has devised a way to allow AED to be installed outside. As these boxes are placed with a street light, emergency life saving measures can be taken at night. The independent source allows for the humidity to be managed even in case of emergencies. Within Japan, the AED boxes are ensured in case of theft. This solar powered LED street light comes with phone charging stations. As the system is independent of any standard utility power, it provides lighting every day even during emergencies. The board in between the two columns could be used as an information board. As an optional plan, a QR code could be placed on the information board to share timely localized and useful information. 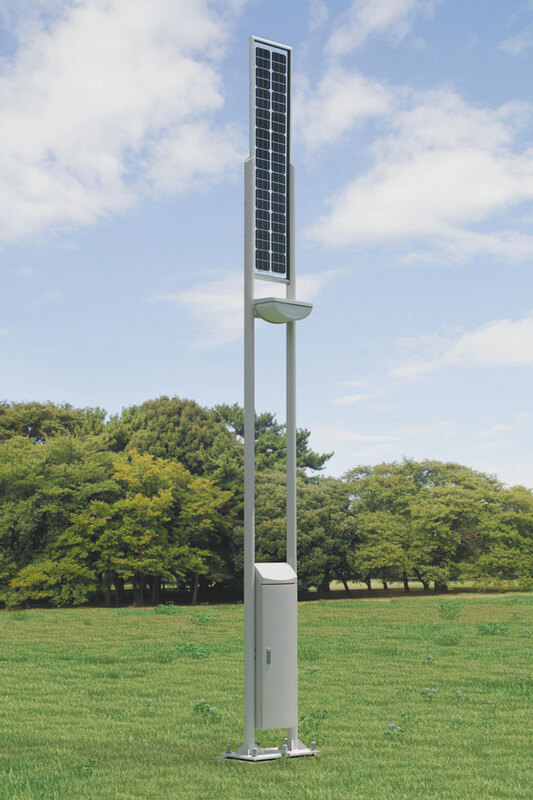 This streamlined design makes this model more affordable while maintaining the functionality of ecoAvenue series, Kikukawa's solar powered LED street lights. The single column and its compact size allow installation in various places. Using KIKUKAWA's expertise on metalwork, custom street lights have been fabricated and installed to various stations and cities. For a one and only illumination in the world, KIKUKAWA will actualize your design intent.